Who is the Wise General in Afghanistan? In my last email on this subject, "SES X" shed additional light on the question by matching changes in the growth of per capita GDP to an innovative metric that combined each party's majorities in Congress with Presidential administrations. The most unusual part of that analysis is the relatively poor performance during the Eisenhower Administration, which contrasted with the successful reduction of national debt during that period as shown in the first message on this subject (here), not to mention the general memory of a nostalgic sense of spreading well-being. But as my good friend Werther points out below, this has less to do with the analytical method of "SES X" than the fact that GDP can be questioned as a measure of economic well-being. 1. All manner of extraneous and potentially misleading economic inputs go into GDP. Everyone knows the story about how cleaning up after a hurricane or repairing a crashed automobile adds to GDP, but no one hopes for more hurricanes or automobile crashes to grow the economy (the "broken window theory" of economic growth). Privatization of prisons stimulates business investment and creates jobs and therefore adds to GDP, but does increasing crime rates or increasing the number of crime subject to imprisonment and the severity of sentences, which increases demand for private prisons and law enforcement jobs and therefore GDP, measure an increase in the general wellbeing of a society? 2. Many other economic activities augment GDP, but may not help the real economy, which I define as the application of technological innovation to produce real, tangible goods and services. Real estate flipping and packaging mortgage backed securities and other financial innovations (e.g., credit default swaps) may have technically augmented GDP by increasing profits, investments, and jobs in financial institutions since 1980, but they are to the real economy as cocaine is to nutrition. 4. There are other issues as well, such as arithmetic average. Of particular importance is the effect of the trend toward sharply rising income inequality. What is the average of your income, my income, and Bill Gates' income? Using the average would lead to a totally misleading conclusion about our incomes. While not as extreme as that, average per capita GDP could slant things in a similar direction. Since the 1980s, there has been a large increase in Americans with extremely high incomes, at the same time that median household income has stagnated (while the bottom two quintiles have shown real decline). That is the case even though these extremely rich people still constitute only a tiny percentage of all Americans. Many of the rich, in fact, are so off the charts that I believe it skews the entire picture of national well-being (using, admittedly, a different measure of well-being -- wealth rather than income -- we see that in 2005, the Walton family had a net wealth of $86 billion: the same as the net wealth of the bottom 40 percent of all Americans). The pioneering work analyzing the changing patterns of income inequality by Emmanual Saez is particularly important in this regard, and I recommend it to your readers. 5. There are all manner of subjective issues pertaining to "how well is the economy doing" that do not show up in statistics. In the 1950s, household income might have appeared constrained in our 50+ year retrospective look because in most cases there was only one worker per household. Now it takes, in most cases, two people working full time because wages have stagnated, which then magnifies itself by creating additional demand for more low-wage jobs related to child care. 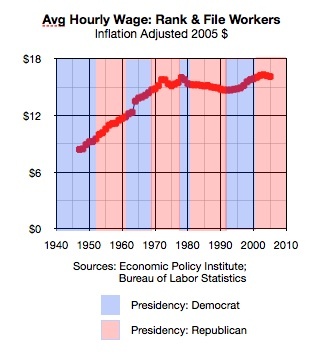 The attached figure on real hourly wages may be of interest in this regard. Note how there is a consistent increase through the 1950s. 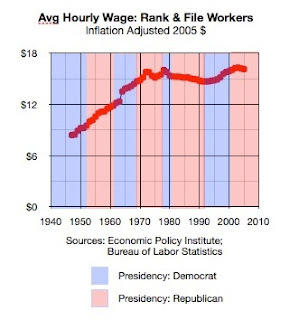 Note how they stagnated after 1972. The reason for this discourse is my astonishment at how badly the Eisenhower administration shows up in SES X's analysis of the statistics. Granted that people's feelings are subjective, but I don't think the entire American public was suffering from mass hallucination in the 1950s. There was a broad and deep popular sentiment that things were getting better, and that the economy was booming (there was an exception in the recession year of 1958). But unless I am greatly mistaken, the Zeitgeist was one of economic optimism -- certainly not something we've seen lately. * Werther is the nom de plume of a Northern Virginia based analyst. Last November 12, I distributed a blaster that compared changes in the debt burdens to Presidential administrations from Harry Truman to George W. Bush. For readers who missed it, James Fallows of the Atlantic Magazine picked it up and published it here. At the time, its stark pattern generated considerable interest and criticism, but I suggested that assigning responsibility for was a complex issue and that this chart was only a "first cut." Attached herewith is an analysis that could be considered a "second cut" into the general question of whether Democrats or Republicans are better for the economy. Like my table on changing debt burdens, this "2nd cut" is by no means a definitive answer to the general question of what politics are more responsible for our current economic mess, but it is also interesting in its starkness of patterns. The author must remain anonymous, because he is an apolitical career civil servant in the Senior Executive Service (SES) of the US government. I can say that he was hired during a Republican Administration. He is relatively conservative (probably center right and certainly not a partisan member of the so-called left). He is not an economist, but has a PhD in a hard science; he is extremely well read; and I have long had enormous respect for his wide-ranging curiosity. The attached analysis has three tables which may not convey in some email systems; therefore, for those readers having I am attaching this report in pdf format and MS Word format for those of you who have trouble reading this. Are Republicans or Democrats Better? What period of time should be used in the comparison? What metric(s) should be used for comparing economic performance under different administration? How should one measure the extent to which each party controls the government? Before going any further, it should be noted that US economic performance depends to a great extent on government policies, but also depends to some extent on factors that could not reasonably be controlled by the government – a luck factor. There is no attempt in this paper to identify “luck factors” or estimate their impact. Period of time. I propose to use the period from 1947 through the most recent data available (fall of 2010). Any attempt to go back even one year more would introduce the need to account for the impact of World War II, as the nation was de-mobilizing all through 1946. Moreover, the quality and extent of the available information decline greatly during and before World War II. Metric(s). This is a more difficult choice than the period of time. Unemployment is certainly critical, but the average unemployment rate during an administration is critically dependent on the unemployment rate at the start of the administration. If the unemployment rate is 12% when a president takes office, it may take five years or more of persistently good policies to get the unemployment rate down to something tolerable. Within historically typical US values, inflation lacks merit as a metric. At very high levels, inflation is intrinsically bad, but, at historically typical US values of 1% to 5% per year, it is hard to correlate inflation with general economic well being. An inflation rate of 1% per year, with the median household income growing at 3% per year, is effectively similar to an inflation rate of 5% per year, with the median household income growing at 7% per year. Inflation-adjusted median household income would be an excellent metric, but I have not found data for this going back far enough to permit a robust comparison over many administrations. If I find such data, I will expand this paper to include it. I settled on inflation-adjusted per capita growth in the gross domestic product (GDP) as the metric for comparison. Good information is available back to 1930 and the metric is generally reasonable. The largest drawback is that it does not discern between broadly based growth – a rising tide that lifts all boats – and growth concentrated mainly in the wealthiest few percent (or even fraction of a percent) – a rising tide that lifts only yachts. 50% credit for controlling the presidency. 0% to 25% credit for having a majority in the Senate. If control of the Senate changes hands during the presidential administration, then credit would be between 0% and 25%, based on how many years, out of four to eight, the president’s party controlled the Senate. 0% to 25% credit for having a majority in the House. If control of the House changes hands during the presidential administration, then credit would be between 0% and 25%, based on how many years, out of four to eight, the president’s party controlled the House. “Control” of the House of Senate usually goes in simple two-year blocks. The only recent exception occurred during the first two years of the Bush the Younger administration. In January 2001, there was a 50-50 tie in the Senate, which would have allowed the vice president to cast the deciding vote in the event of a straight party line split on a topic. About a year into the administration, a Republican Senator became an Independent, giving the Democrats a 50-49 majority. During 2001 and 2002, I will give the Republicans and Democrats credit for “controlling” the Senate for one year each. AND NOW FOR THE RESULTS! Having decided on the metric, when to begin the comparison, and a method for assessing relative Republican- Democrat control of the government, it is still necessary to decide what period of performance to assign to each administration. A president is inaugurated on January 20. After that date, it takes some period of time to get his economic policies in place, plus some additional time for those policies to have an effect. It is hard to determine this “lag time” with any rigor. April 1 of an inauguration year through March 31 of the next inauguration year. For example, this would give the Clinton administration credit or blame for the first three months of 2001 and the Bush the Younger administration the credit or blame for the first three months of 2009. July 1 of an inauguration year through June 30 of the next inauguration year. October 1 of an inauguration year through September 30 of the next inauguration year. The three tables below show the results for all three periods of performance per administration. The tables include five administrations with Republican presidents and five with Democratic presidents. There are five administrations with Democratic control ranging from 62.5% to 100%, two with 50% Democratic control (a Republican president with Democratic majorities in both the House and Senate for the entire administration), and three with 62.5% to 84.4% Republican control. * Results = average growth in inflation-adjusted GDP per person for the period listed. Obama: President 15 months, House 15 months, Senate 15 months (out of 15 months). The Obama results should not be weighted very heavily, due to the short period of time involved. The Democrats easily win the comparison, as shown in the tables below. In all three tables, the “top two” administrations (out of ten) had more than 80% Democratic control and the “worst three” administrations had 50% to 84% Republican control. The only Republican administration in the top five was Reagan. Reagan rates third, fourth, and tied for fourth in the three tables. Clinton always rates either third or fourth. Obama always rates either fifth (twice) or seventh (once), but his period of performance is too short to be very meaningful. Carter rates anywhere from fourth (tie) to seventh. Given the negative press that he has received, this may be slightly better than expected. The biggest surprise may be that Eisenhower finishes in the bottom three every time, including a tie for last in one case. It should be noted, however, that the nominal number one administration of the last 41 years featured greater than 50% Republican control (Reagan), but also that performance under Reagan and Clinton was effectively identical.